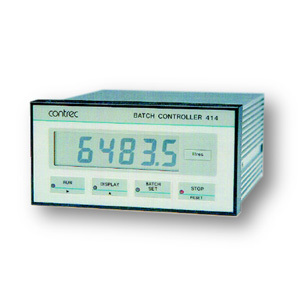 The Contrec Model 414 Batch Controller is suited to flow applications where precise measurement and control of batch quantities is required. Batch total, flow rate, accumulated total and preset value can all be displayed in engineering units on the large LCD display. The 414 will interface to most flow meters with versions available for pulse and analog inputs.